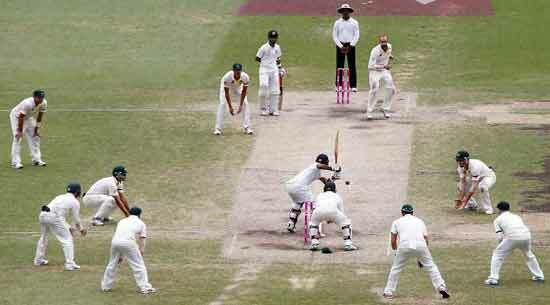 Test cricket, when it started was quite different from the matches as we see them now. The rules and specifications for the kit used by the players, the dimensions of the ground and many other things were so different as to be unrecognisable today. The 15th of March, 1877, saw the first Test Match played in England, between England and Australia, which the later won by a margin of 45 runs. In 1977, in the Bicentenary Test played at the Melbourne Cricket Ground, Australia beat England by the same margin, 45 runs. At the time these matches were played, they were not called as a Test between the two nations. This would come much later. Matches played prior to that were then recognised as Test matches, and included in the records. The teams representing the two countries were not the strongest teams that the nations could deploy. The sailing time of more than a month and a half were a deterrent for players to volunteer for a tour. So the teams were made up from the actual cricketers and even some sailorsat times. A tour meant for England to tour Australia was organised in 1789. But the outbreak of the French Revolution resulted in the tour being abandoned.It was much later in 1859, that the English put together a team that toured the United States and Canada.There were two tours to Down Under by teams just put together. The first tour was in 1861 and the second in 1863/63. The second tour included New Zealand in its itinerary. In 1868 a team comprising of Australian Aborigines sailed to England. The two countries were in the process of putting strong teams together with some official support. The first Test tour in 1877 saw the ‘Combined Australian Eleven’ played England. As seen earlier, the match called the ‘Grand Combination Match’ was won by Australia. It was on the fourth day that England, requiring 153 runs to win was dismissed for 108 runs. The second match followed and was duly won by England. The two matches were played as timeless and with four ball overs being bowled. The scores and other details were mostly dug up after the two matches were designated as Tests.After several tours between the two countries the Test match played in England in 1880 is seen as the match that set the tone for rivalry between the two teams. It was a good match in which Australia, after following on set a target of 57 for England. The home team was in trouble at 31/5 before WG Grace rescued them. In 1909 the International cricket Council was formed with South Africa as a new Test nation. India, New Zealand and the West Indies became members in 1926 and Pakistan in 1952. Only Commonwealth Countries were admitted to the group.India played their first Test Match against Englandat Lord’s, London, captained by CK Nayudu and lost it. A wait of twenty years ensued before India won their first Test against England at Madras, now Chennai. Today India is a powerhouse in world cricket being ranked first in both Tests and One Day Internationals.